Tag Archive | "Reporters Without Borders;"
Our Cotacachi Spanish course just finished. See yesterday’s message Cotacachi Health Opportunities about this course. 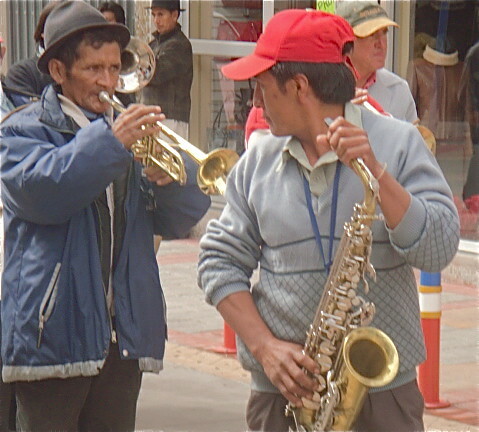 During the course Cotacachi was the center of a massive demonstration that may lead to some significant political impact. Here is a comment about this from Journalists without borders. Community journalist arrested during indigenous people’s protests against mining law. Reporters Without Borders today demanded an explanation from the authorities about the reasons and circumstances of the arrest yesterday of community journalist Francisco Farinango in Ñaño Loma, in the Pichincha region of northern Ecuador. The reporter on Radio Intipacho was arrested with three other members of his Tupigachi community on the sidelines of nationwide demonstrations by indigenous communities against a new mining law, which locally degenerated into clashes with security forces. 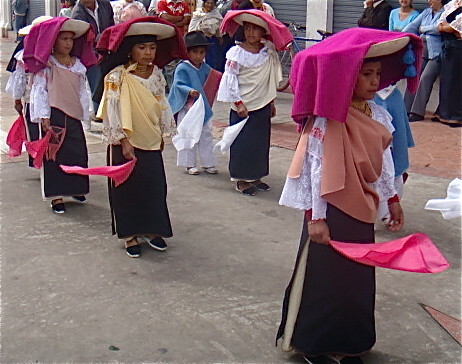 The capital Quito is in the Pichincha region. Police sources cited by the national press said that the journalist had been accused of having “incited” his companions to demonstrate and would shortly appear before a court. A total of nine people were held and six others injured during the demonstration. “An arrest against the background of a demonstration, possibly a riot, makes it difficult to check the allegation that Farinango had ‘incited’ members of his community to rise up,” the worldwide press freedom organisation said. “Why him in particular?” it asked. A community journalist is by his nature witness and actor in an event that affects his community, a witness who could be awkward in a crisis. We fear that the arrest of Francisco Farinango only serves to punish his media and we ask the authorities to clarify their reasons,” it said. Indigenous communities mounted protests in nine of the countries 24 provinces on 20 January against the environmental consequences on their lands of a new law allowing open cast mining. The day was marked by some localised blocking of roads and clashes with police. 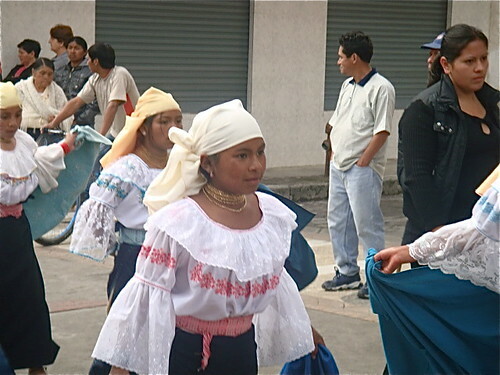 Interior minister, Fernando Bustamante, said there had been an “attempt to destabilise the country and its government”, a statement which provoked an outcry from representatives of the National Confederation of Indigenous Nationalities (CONAIE), who said they held the minister responsible for the physical wellbeing of the detainees, along with his counterpart at internal and external security, Gustavo Larrea, and the President, Rafael Correa Delgado. We look more deeply into this demonstration and the political impact in our upcoming Ecuador Living update. You can get that update as a subscriber to Ecuador Living. Of course our Cotacachi Spanish course delagtes did not see any of this in Cotacachi. They saw a parade instead. Having bragged about the success of the Cotacachi Spanish Course, I must announce that we have canceled our May Cotacachi Spanish course. In a way this is good news…created by bad news….that creates more good news. Here is the bad news that creates the good news. The global investment world gave their opinion of President Obama’s inaugural speech with this. 500-stock index fell 5.2 percent. I really like Obama but do not feel that increased US government spending is the way to resolve the world’s economic imbalances. This news creates some unprecedented opportunity and I have been working closely with Jyske Bank and Jyske Global Asset Management (JGAM) to help our readers understand why and how the current economic corrections create phenomenal investing value. Therefore we have agreed to replace our May Spanish course with a Global Asset Value to join up with JGAM and speak at their JGAM Global Asset Value Strategy Seminar in Naples Florida, May 29 to 31. Investing values are so special now and investors have been hit s hard that we feel it important enough to take the unprecedented step of canceling a course in Ecuador (we have not done this in the past 20 years). One way to take advantage of this opportunity is by investing British pounds now. Here is an excerpt from today’s Multi Currency course. Jyske Global Asset Management just set me this note. At the Investment Committee meeting on the 15th of January we decided to take a long position in GBP & JPY against USD. The stop loss level in GBP was reached before the position was taken. We thus had an Ad Hoc meeting today to consider our options. We decided to take the long position in GBP at these new levels as we feel it has fallen to much to quickly and should be poised for a rebound. See the entire lesson and ways to invest in pounds now by subscribing to our Multi Currency Portfolios course. Another way to beat the economic downturn is with your web based business. Here is an excerpt from our newest course Tangled Webs – A Web Business Course – Lesson Three. The creek sighs into an inky night’s prefect harmony of…katydid, cricket and the hoot owls that punctuate nature’s noisy silence and lulls us in our sleep. 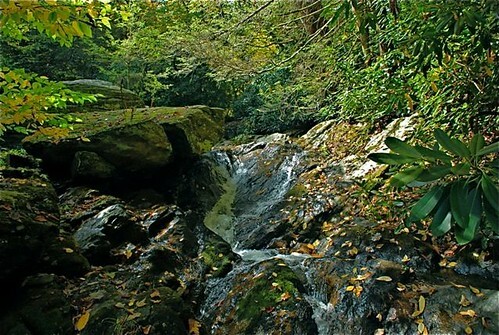 Merri and I slept in our Colman tent next to this water fall, dreaming content in our evolution…from the US, to Hong Kong and Europe, years in London to Florida and a 5,000 square foot house on the beach…rising to this…a tent deep in a Blue Ridge woods. This is how we started our farm…from a tent….open fire cooking and boiling water from the creek. When I say remote…I mean remote. 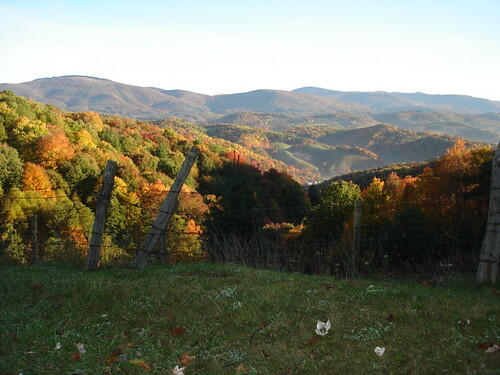 Here is one of our farm views. We are isolated. 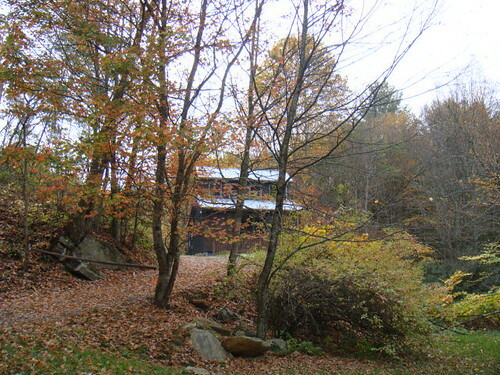 Here is the office/seminar center we built in the deep woods. Our hacienda in the Andes is even more remote. 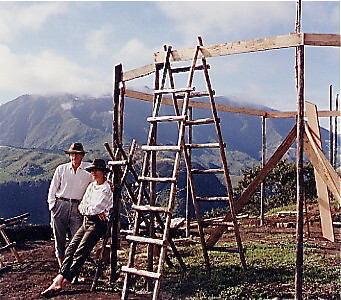 Here I am with Merri building a hut on the hacienda. Friends who knew us first when we lived in Florida and drove a Rolls Royce were often shocked when they came to visit and discover that we were instead driving a beat up Ford pickup and living in a tent! We had a Bentley as well! 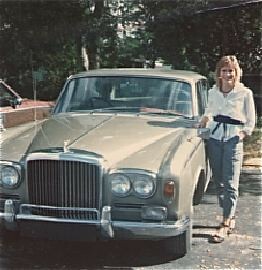 Here is our daughter Cheri enjoying our classic Bentley T.
What an evolution. Let me tell you about this Ford truck. Brown Betty we called her. 1987-brown-rusting, scratched-143,000 miles-long bed-four wheel drive-eight speed stick on the floor-big engine-huge six ply snow tires. I bought her for $2,400 bucks. This truck was tough! When Merri, me and Ma (our pumpkin patch hound) have a heavy job from carrying railroad ties (we were building a bridge on the land) to taking rusted barbed wire we pulled out of the creek to the dump, the truck got the job done. We did not worry about the innumerable dents scratches and nicks we put on that truck for a minute. This was the perfect vehicle for the farm at that time. Rain, mud, frozen roads or snow, that truck kept going. With chains she was a Sherman tank that could carry hay. We have since upgraded to a more fuel efficient…but still dented and scratched mid size pickup. 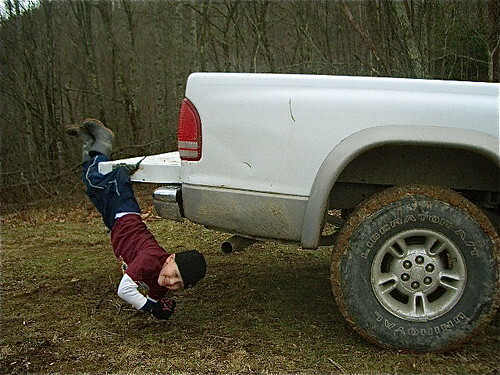 Here is our grandson Garren learning how to climb on back the hard way Christmas 2008. 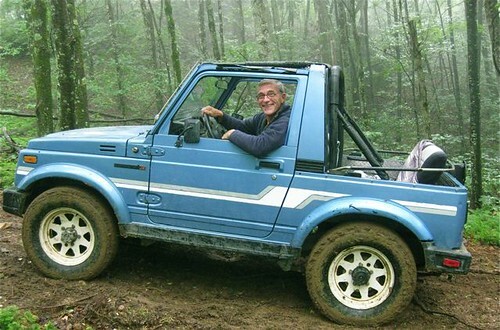 Isually I drive my little Suzuki 4-banger…now 23 years old! What does beat up trucks and Rolls Royces have to do with having a web business? First we may have been the poorest looking multi millionaires around….but please do not make a mistake… we are multi millionaires…even after the 2008 crash and our business is booming..all because of the internet and our web based business. You can be also and this course shares how to have financial success. Or better join us in March or February and get this course free and save $299. Join Merri, me and Blaine Watson, plus enjoy a shamanic ceremony in the Cotacachi Shamanic Valley. Join Merri, me and Peter Laub of Jyske Global Asset Management at OUR INTERNATIONAL INVESTING & BUSINESS COURSE IN ECUADOR. We review economic conditions, Ecuador real estate, my entire portfolio plus investing and business ideas for the months ahead. Here is some bad news created by good news. I just received this note from the flower farm we work with. The bad news is we are out of Valentine roses. The good news is we sold almost 20,000 roses in just over a month and earned almost an extra $7,500 (which we are donating to help the poor of Ecuador). We know how to help you create your own import export business to secure your purchasing power. 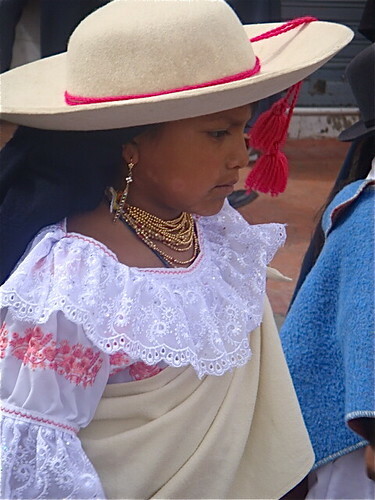 Join us in march for our Cotacachi Import Export expedition and real estate tours. This is why Merri, our webmaster and I decided to create a new course on how to build a web business with a webmaster. Here is a special offer on this new course. You can enroll in this special course for $299. However if you sign up for all three courses in February or March 2009, I will send it to you free. You save $299. Bob Shane will be at our March course and will be available to provide health balancing.